I hope you were all able to enjoy some of the warmer temperatures over the weekend. Unfortunately, we are back to rainy weather. I feel bad for the runners of the Boston Marathon today! Our third and fourth grade learners have been preparing for their presentations and productions this week. I hope you will be able to come and check out their hard work. Please be on the lookout for your child’s talent show permission slip. It will be coming home this week. Start planning your act so you can get your permission slip back to school as soon as possible. April is National Poetry Month. The PTA will be holding their annual Poetry Contest. I’ve attached the flyer with more information. Please check it out and encourage your child to submit a poem. ﻿Have a great week and enjoy vacation with your child next week. The PTA will host a Poetry Contest in April. The deadline for submissions is April 17th. Please see attached for details. This has been a very challenging week for our school community with the passing of Jane Avery, one of our paraprofessionals. I want to thank the entire staff for providing a supportive structure for our learners during this difficult time. I also want to thank all the families that sent their condolences. Please know that we are here for your child if they need any support. This Friday we will host another amazing showcase at 1:45pm. PTA will be running it’s annual poetry contest in April. The entry deadline is April 17th. We will be boiling again this Tuesday. We invite you to come by to check out the sugar shack and learn more about the maple sugaring process.Have a great week. The Gilford Elementary staff is beginning our work on student placement for next school year. We invite you to complete the Parent Input Form (not a requirement) attached to this email. We welcome your input about your child to assist us in the placement process. If you have any questions, please contact me at 524-1661 or dbolduc@sau73.org. I hope everyone enjoyed their weekend. A big thank you to the Volunteer Steering Committee for hosting our Family Skate. It was a great turn out on Saturday. Hopefully we will be collecting sap this week. We are looking to push out the Maple Syrup Pancake Breakfast into April. I don’t think we will have much syrup produced in the next two weeks. I will be sure to let everyone know when we are boiling, so you can come check it out. I know the children are excited to start this process. The children had fun finding the hidden fruits and veggies in the hallways on the way to lunches on Friday. They also tried a very tasty treat made with a secret ingredient. They were asked to guess which healthy food was in their treat. This Friday we will hide another ingredient for them. This month we have sent home a Courage calendar. It is our hope that this calendar will encourage and guide everyone in taking small, but impactful steps to practice Courage on a daily basis. Tuesday is voting day! Please vote. March 8th - Tomorrow we will celebrate Read Across America by wearing our Cat in the Hat stripes! 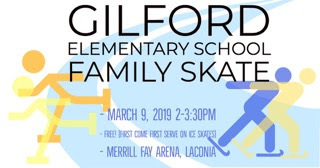 March 9th - Our volunteer steering committee will once again hold a free family skate from 2:00-3:30 at the Merrill Fay Ice Arena. March 8th - Nurse Jenn will speak with all learners at lunch about Nutrition Month and all learners will try to guess the “secret” ingredient in a tasty treat. I hope everyone enjoyed their winter vacation. Unfortunately, the weather this past week was too cold for the sap to flow, except for today. I am hoping that March will bring some warmer temperatures. Mrs. Brace would like everyone to know that the American Heart Association envelopes can be brought in on Monday, March 4th. Thank you to everyone that supported this year’s Kids Heart Challenge. We will be celebrating Read Across America Week. On Monday we will enjoy Green Eggs and Ham for Lunch and on Friday, wear your Cat in the Hat stripes to help us celebrate Dr. Seuss’ birthday! Our volunteer steering committee will once again hold a family skate on Saturday, March 9th from 2:00-3:30 at the Merrill Fay Ice Arena. I hope you are all enjoying this winter vacation. I have spent some time this vacation with parent volunteers getting our sugar shack ready for our first boil. A huge thank you to Province Kiln Dry Firewood for donating 2 cords of wood. Now all we need is some sap. I am looking forward to warmer days and cool nights which will allow our sap to flow. This wind has certainly been a challenge to keep the buckets on the trees! March is National Nutrition Month which focuses attention on the importance of making informed food choices and developing sound eating and physical activity habits. Every Friday, Nurse Jenn will speak with all the learners during their lunchtime. Our focus this year will be on hidden nutrition. There are some fun activities planned for everyone!